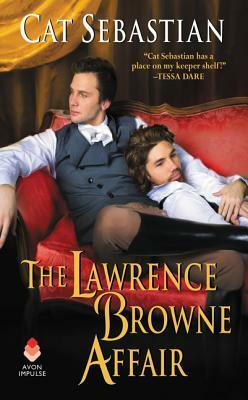 The Lawrence Browne Affair is an immensely enjoyable historical romance: honest and witty, with plenty of snarky banter (Georgie is a master of dry humour), a dash of danger, and two imperfect men who belong together. The earl dropped the ax long enough to strip down to his shirtsleeves. That couldn't be necessary, given the chill in the November air. But on another, purely aesthetic level, it was quite, quite necessary for this man to take off his clothes whenever the spirit moved him. I liked Georgie, but Lawrence (who has severe social anxiety and is possibly on the spectrum) stole my heart. This isn't a fast-paced story; it's gentle and surprisingly sweet. Georgie, a thief and swindler on the run, can't bring himself to steal from Lawrence, the "mad" earl who's not mad at all, just misunderstood. "I've been here for two weeks, and I'm still waiting to see evidence of this madness . . . I have to say, I'm fairly disappointed. I had hoped for some good old-fashioned howling at the moon, and all you do is build ingenious inventions and eat too much ham." Georgie poses as a secretary, and he is an incredibly efficient one, but he also becomes Lawrence's friend, his lover, his confidante. The accidental "house party" Lawrence hosts is a joy: a rather awkward, inside-out take on a proper le bon ton affair. While the steamy scenes are somewhat muted, I never doubted the connection between the MCs. An epilogue wouldn't have gone amiss, but the ending is nevertheless a believable and romantic HEA. Highly recommended for fans of Regency romance.